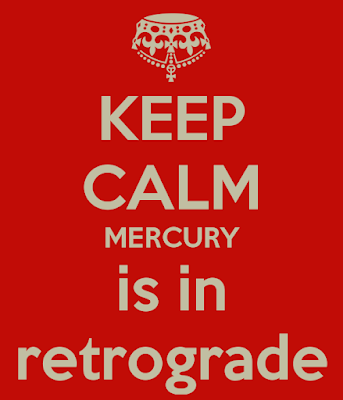 The planet Mercury goes Retrograde three times per year for a 3 week period of time. A period of time that is said to wreak havoc on communications (Mercury is the Communication planet), a time where you are NOT to sign a contract under any circumstances, a time when electronics go haywire, or worse still you may lose them as during this time period people are prone to losing stuff, and by no means should you accept a job offer (you are to try and stall the offer and sign AFTER the retrograde period). (1) When people gave me that "I don't understand you look" or if I said 'Purple' they said 'Yellow' - where it was important they understood me I repeated the same thing in so many different ways - with patience - that eventually they got it. Problem Solved. (2) When I got those annoying email pitches from PR Reps and Brands asking me to publish a press release, host a review or giveaway in exchange for product - where I normally responded with a Media Kit and ask specifically what their budget was - or better still asked them if they got paid in the product they are pitching if they were snippy - I did this with some and when I got a response saying 'other bloggers would do it' if I won't - Again this is where I normally would tell them go ahead and reach out to those bloggers then - this time I responded all month with this simple and poignant sentence - "I can offer you quality work, I cannot offer you free work." - Not one PR person had a 'snappy' comeback for that sentence - not one. This is how I will always respond to requests for free use of my time and publishing space. It is simple, effective and doesn't appear to allow for rude retorts. Yet another problem solved. (3) Since 'Losing Things' under the influence of a Mercury Retrograde can also be 'electronic losses' I was sure to back up files and save work in progress after every sentence - annoying? A bit perhaps but no articles got lost mid-way. And any writer who has written a full article only to watch the screen go blank and not have the work come back can attest to just how horrible an experience that is. You can NEVER re-create the work the same way it was first written. So hit save often while you are writing - In my opinion, not just during Mercury Retrogrades as precaution but all the time. (4) I did experience some electronic snafus - apps that just stopped running - un-installing and re-installing did the trick for most. and for some reason I did have products die on me - a television and an electronic device I purchased for someone as a Holiday Gift (both purchased WAY before the Mercury Retrograde oddly) - I didn't lose it like I might have in previous retrogrades. I dealt with each problem one by one. I untangled each tangled thread individually. Some took more time than others, one I am still working on. As an Aries I like tackling issues head on, it's just the way I am. I am beginning to see Mercury Retrogrades as a cold or flu - like a cold or flu forces you to 'shut down' for a few days - a Mercury Retrograde is sort of a cold for the spiritual you that sometimes need a reminder to slow down, re-trace your steps, be careful. By the way, Jupiter is also Retrograde! The reason things worked out differently for me during this particular Mercury Retrograde is because I handled the situations differently. I managed my reactions differently (not so easy for an Aries with Scorpio Rising to do), and in doing so experienced different outcomes. Our 'problems' are as much a 'perception' as our blessings are and when we react to our 'perceived problems' in a new way we will experience different results. Because I learned to weather the 'Mercury Retrograde Storm' I have very little fall out to deal with. And now that the 'cosmic climate' is coming close to being back to 'coast is clear' I am ready to take on what is going to be a very new year for me in so many ways. Call to Action/Readers Sound Off: How did YOU fair during this month's Mercury Retrograde? Was yours frought with arguments, mis-understandings, electronic snafus, losing things or other forms Retrograde Chaos? How did you handle those situations? FTC Disclosure: All opinions are 100% MY OWN. This is NOT a Compensated Post. I am disclosing this in accordance with the Federal Trade Commission 16 CFR, Part 255 - Guides Concerning the use of endorsements and testimonials in advertising, you may check our Giveaway and Disclosure Page for additional information regarding Ascending Butterfly Disclosure. Mercury. That planet is a big, fat meany. You know, I used to think it was all a bunch of bull, but I swear every time Mercury goes into retrograde something abysmal happens. What a great post i love reading this and i learn some new info. Oh, I also get those annoying pitches. When I send them my media kit and my price, some of them would haggle, but most of them will not respond. I like that, I think I'll use that phrase with PR's next time as well. I dislike that most think we are to do work for free. I think people hear that mercury is in retrograde and get themselves all worked up. They cause half of the chaos themselves. I like your response to the PR companies. Quality work is incomparable! Excellent response and well respected. Great Info! I love how you responded to the PR reps! I do believe how you handle situations has a huge impact on the outcome. I didn't even know that Mercury was in retrograde! That would definitely explain a few things I dealt with, lol. I have an app on my phone that can be checked to see if Mercury is in retrograde! If it's not it will say 'No; something else is bumming you out'. So glad today is the last day. I forgot how much astrology can affect us. My Dad is often found saying "it's a moon phase" when I call him crying over something my sons are doing or how they are behaving all of a sudden! Great post! 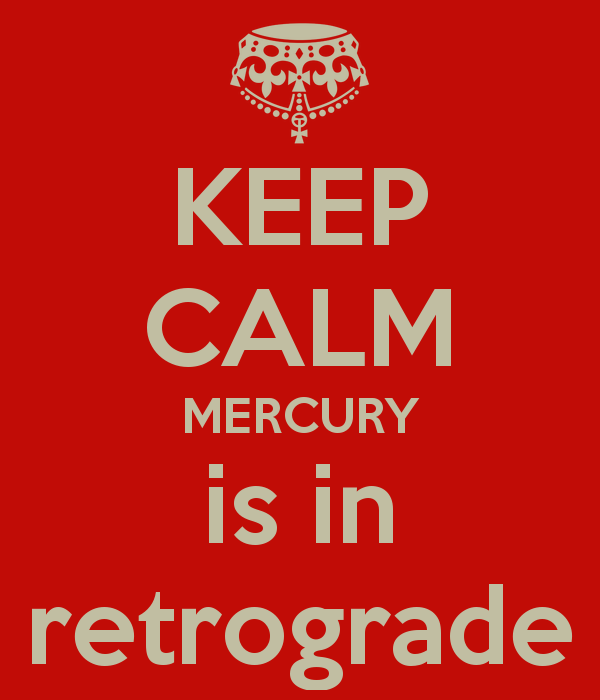 i keep hearing about Mercury Retrograde. I keep saying I'm going to take the time to find out what it's all about. I'll be honest, I don't know anything about Mercury! But I know some times things just don't run as smoothly, and I can't figure out why. I now know who to blame! I really cant stand Mercury Retrogade. Its so annoying I broke my phone 3x last year and lost it because of it! I am gonna try to fight against it with positive vibes I hope it works! This is so interesting. Things have been going well so i do not think it affected me. This post is new learning to me. PR reps, while I understand they are just trying to do their jobs, really need to learn how to communicate better. I love the "I can offer you quality work, I cannot offer you free work." It is great to learn how to handle situations differently. It can really help change your perceptions. Quality work, not free work: smart! I don't pay attention to Mercury retrograde though. I do notice effects of the full moon though! As strange as it sounds, for everything that got lost, a formerly lost item suddenly appeared. Mercury Retrograde definitely created some havoc, but it was entertaining chaos. I love the response you gave to PR agencies asking for work for free. You've got some simple nifties in this post. I like! I was not familiar with anything to do with Mercury Retrograde until reading this. Very interesting. About the annoying PR communication…I cannot stand when companies send me information and ask me to post about it. What really annoys me more is when they follow-up on whether or not I posted it.